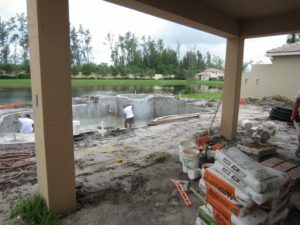 If You're Building A New Pool, here's help with landscape planning cost & design - Universal Landscape, Inc. This is a loaded question, which can have a number of different answers depending on your goals, property size and any existing or possible new issues that could occur from changes to the property. While we can’t provide an exact price on any work here of course without exact details of a project, but we can give general ideas as far as budgeting. When it comes to the new design aspect of landscaping, people have very different tastes and goals very often, but we can still provide some general ideas of what to think about and some help with forecasting a budget. We are going to start off with some common aspects of additional costs that can occur when building a new pool or patio at your home and then give you different scenarios depending on what your property size might be verses what you might be looking to achieve. The largely ‘Unavoidable Extra Expenses’ of a new swimming pool being installed. Irrigation : This work will be required for most any new pool construction. There are 2 phases a) Capping off irrigation before construction begins b) Re-connecting irrigation after the pool is built. Capping off the irrigation to prep before the new pool is dug. The pipes of the irrigation are usually found on the sides of the house in the back corners of the home are to be dug up & capped which would cut off the irrigation system from watering any of the area of pool construction for the duration of the project. ‘Capping off’ is exactly as the words sound, a cap is put on the end of a cut pipe that leads to the backyard. With that cap securely attached, and the other old lines disconnected, this makes sure that water will not be running through the irrigation system during the construction process for the areas required and determined by which irrigation zones were ‘capped off’. Capping off the irrigation is very important to have done for many reasons. During the excavation & work in building a new swimming pool, irrigation lines can and usually are broken throughout the yard where the construction takes place. If irrigation lines are not capped off, these same lines, when often broken can cause significant damage to the new pool or the home during construction at times, or even if not recognized, can cause problems after the construction is completed when everything looks finished and done. Damage to pool construction can occur as the photos below show in this extreme case here, as the irrigation lines were not capped off and the irrigation was kept running for weeks. The erosion would continue for weeks until it got to the point in this case that it was close to threatening the foundation of the house. 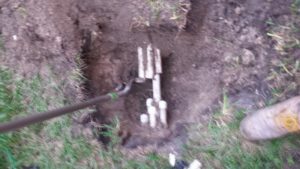 Again, this is an extreme case that could have been rectified as soon as the leak was detected by – Shutting off the irrigation system until the irrigation piping going into the backyard was capped off. As we came in the end of this project and were not involved in the pool construction, we met the homeowner towards the end of the project, well past this initial dig stage in this case. The homeowner provided these photos as they may be of use to others to help educate in becoming more aware of potential problems. They also noted that the pool builder left the situation for weeks, which frustrated the homeowners as well as took a chance with potential damages to the home which could have been easily avoided. The cost of capping off the irrigation by a professional is typically between $125 to $200. Another possibility of damage from uncapped irrigation lines can occur after the pool is completed. If an irrigation line is capped off and re-connected after the pool is finished, it is possible that a small break can occur in the old line and when re-connected, after the pool is finished, which can cause washout at that time. This kind of damage can be seen most notably by sinking pavers or cracks in the concrete deck after the pool is complete. 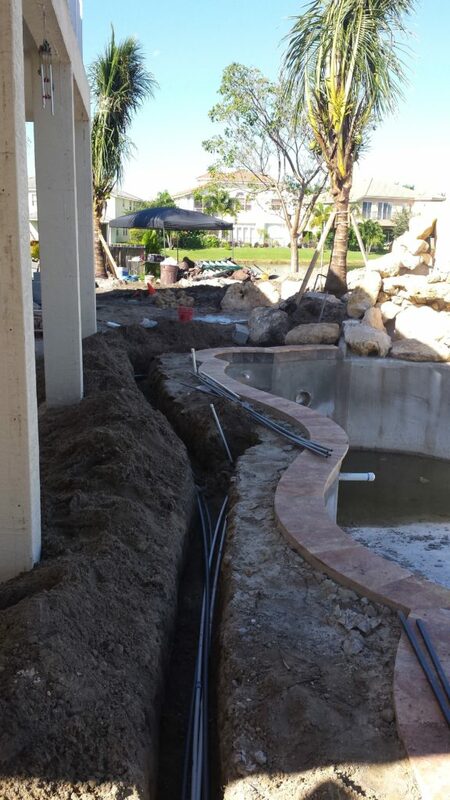 The reason for installing new irrigation lines after the pool construction is as last mentioned above; if you re-connect the previously existing lines, there could be damage below ground that you are unaware of. If those old lines were running under your new decking this can cause a couple of problems from resulting washout. 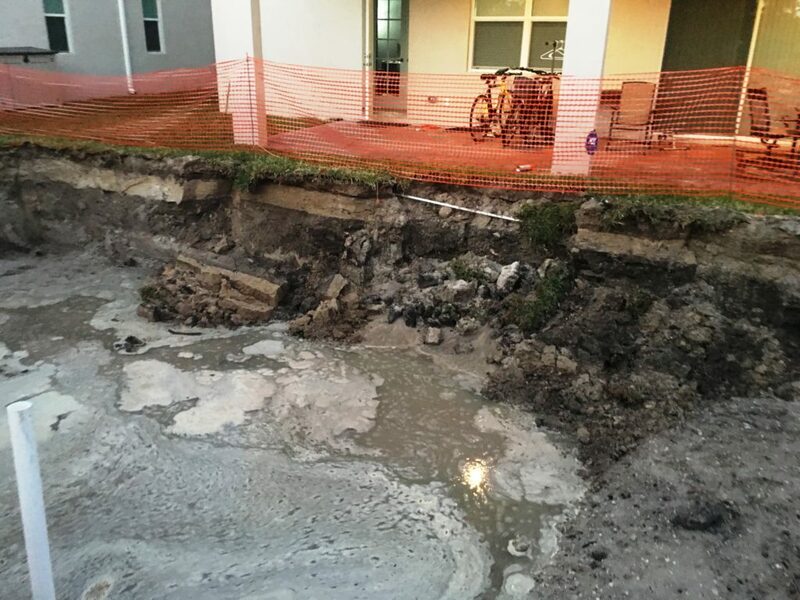 A washout cavity could occur below the new deck caused by an underground crack in the pre-existing irrigation lines to cause cracks or settlement problems in the new deck. That same washout could possibly could also create an underground cavity from washout that could cause a problem with the pool. Another loaded question and this will vary directly on 1) The size of your property and area that needs re-connecting 2) The difficulty of the soil or obstacles that could make the work more time consuming. Xero lot line properties will range from $900 to $1,400 typically. Most other properties, just for the area behind the new pool area, is usually all that is needed. Most properties will range from $1,100 to $1,900 typically. These are by no means fixed prices but an idea of charges for this phase of work to be performed by a licensed and insured irrigation contractor. We are not irrigation contractors but we do work with them. This is often the view after a new pool has been installed, in this case for a xero lot line property. What’s needed : 1) Make sure the grade is performed properly so that the water leaves an area naturally following the grade of the property. Many might think, ‘we can just throw sod down’, and it can be a mistake. Can’t stress enough the importance of removing any debris on the ground and performing a smooth grade of the area, first for drainage purposes, 2nd for a smooth lawn without low spots or uneven areas that can cause a problem walking on later. The answer is generally between 2 to 4 pallets. Property sizes differ, also the amount of damage can vary as well depending on soil, dampness conditions of the property as well as how much damage is done by the operator of the excavation machines. The cost will also depend on how much re-grading is needed to repair the grade conditions as well as accounting for any drainage problems if they exist. So, the cost isn’t just the price of the sod, but the amount of labor to prep the area as well. For those not looking to landscape and just wanting to repair the area after pool construction, figure on your irrigation replacement costs plus a minimum of 2 pallets of sod. Installing sod is simple enough, but it’s the prep work and how cleanly and neatly that it’s installed that makes a difference in the job. When you clean off your pool or patio deck, or any hard flooring surface outdoors with a hose, you want the water to roll off of the deck and into the lawn. You don’t want the water to hit a wall of grass and then come back onto the deck & bringing dirt with it. If you’re lawn isn’t installed by the sides of your patio or pool deck low enough to have the water wash off a deck, during rains, the water from the rain will also run onto your deck more as well. ALSO MAKES IT HARDER TO HAVE A CLEAN DECK AREA. Note : If you’re having landscaping installed; trees, plants, palms, etc. 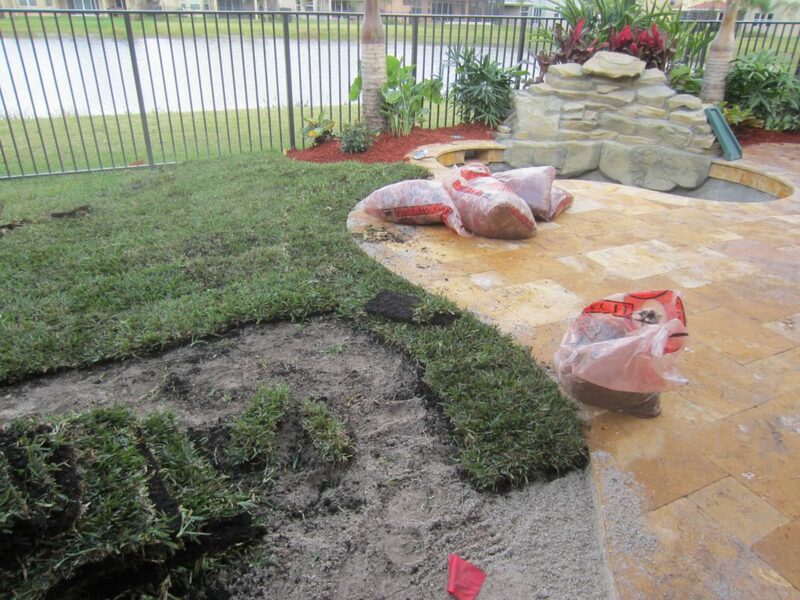 the cost to prep the areas for the landscape will help to absorb the cost of prepping for new sod installation as the grade will (should always) be accounted for when renovating the landscape for a construction area. In regards to sod costs, as there are different varieties of sod / lawns that can be installed, some cost more than others. Least expensive : Bahai, which is not really a nice residential lawn in our opinion and is often referred as a ‘cow field grass’. One reason it’s called this is because it is often found there. This lawn does not grow thick but is very durable, can live without irrigation, can go neglected and survive more than the others. Floritam : The most common lawn in Florida. Durable, holds up well to the heat and rains. Blades are less soft than northern lawns. Palmetto : A good lawn for heavier shade areas. A little more costly than Floritam. Higher priced lawns : Bermuda, Zoysia, Empire, Celebration. These lawns are also higher in maintenance and more tempermental typically. There are a number of factors which can make a good, new lawn go bad quickly or later on after installation. First things to remember, water in for at least 2 to 3 hours the day of the installation and stay on top with watering for the first 2 weeks especially. Fertilize 2 to 3 times A Year the first couple of years. “I live in an average sized lot development, 10 to 30 feet or more from the sides of our home to the property line. How much will the sod installation cost me after the pool is built ? 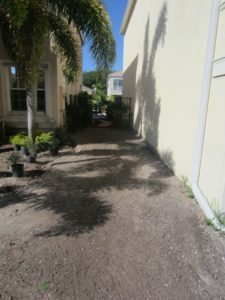 The length of the driveway and, or how far the new pool is away from the street will determine how much sod can be damaged during construction. For most properties you can figure for 4 to 6 pallets of sod will need to be replaced after construction. If you figure on the high side at 6 to 8 pallets, most often you will be adequately covered for sod replacement for many typical new pool installations. If the pool builders or other contractors are working on other projects such as new waterfalls, outdoor kitchens, gazebos, cabana baths, etc. and are using ‘staging areas’ for storing materials during the project and using more machinery than just required for the pool construction, the amount of damage can increase of course. This would increase your need for more sod. Now, if you’re installing a pool that is much larger than normal, the larger the deck can help with reducing sod costs, but everything is relative. The average square footage of a pallet of Floritam sod is 500 square feet approximately. A tip on how to SAVE MONEY & cut down on the cost of how much sod you’ll have to replace after the pool is built! Below are 3 examples of homes that are having pools constructed, one is going to require a lot less sod than the other 2. Heavy machinery & foot traffic by workers during construction are what destroy lawns more than anything else during pool construction. The more damp or wet an area, as in the photo here, the more machines will sink into the ground as they move back and forth. This also increases the labor cost as it is necessary to repair the grade after the construction is complete. , the drier the lawn and ground right before and during construction, the more firm it will be. MONEY SAVING TIP : Shut off your irrigation about 3 weeks before construction is to begin for the areas where the work traffic will be. With a drier property for work traffic, this can help at times to drastically reduce the amount of damage and sod required for repair. We’d like to start off with an important tip : MAKE SURE you’re property is at the proper grade following the pool construction BEFORE THE IRRIGATION IS INSTALLED ! Another tip : If you have pre-existing drainage issues at your home and you’re looking to have a new pool installed, if possible deal with the drainage issues at that same time as that may be the least expensive opportunity to do so. Thankfully, not everyone has drainage problems. For those that do in regards to new pool construction, there’s only 2 ways by common sense that drainage is an issue. 1 the problem existed before the pool was built. The new drainage issue has resulted because of the new pool. The grade levels can require adjusting for a new pool and deck depending upon how the home is sitting on the property and the pre-existing sloping away from the home. Some backyards can be land locked with neighboring properties which sit higher and create a problem not allowing adequate runoff. This is especially a problem when the property isn’t graded so that the water has a chance to escape away from the home’s foundation and off the property to designated easements at the rear, sides or front of a home. The most cost effective time to deal with drainage if possible, usually is while the new pool is being built. The reason is that the property is already being disturbed in a major way and it is much easier to install drainage as the grading work is being re-done. 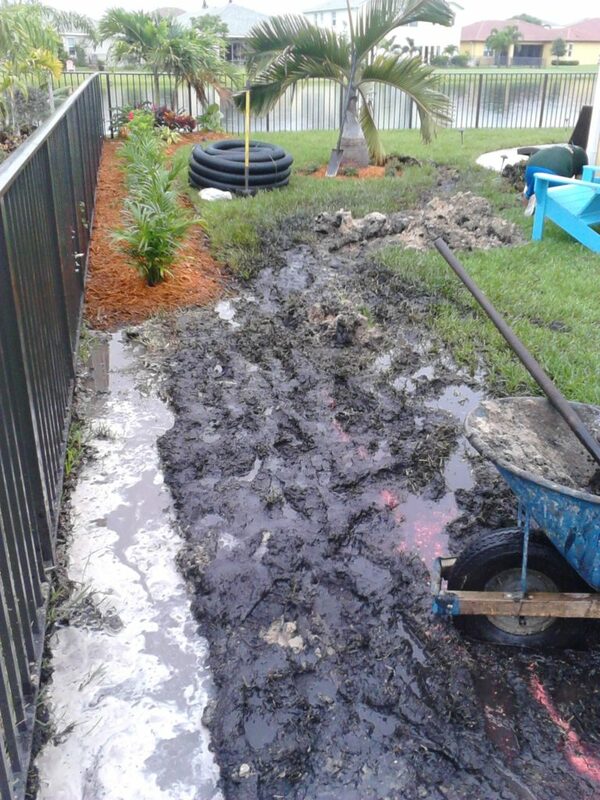 If you’re backyard looks anything like this photo here, this is the best time to install your drainage work. The shell of the pool has been shot with gunite. The plumbing inspection has passed so the open trenches around the pool are filled back in and the pool builder has removed all the excess soil that is not needed. At this point a rough grade by the pool builder has been performed ahead of the pool patio decking to be installed. This is the time to tap into any existing gutter downspouts off of the back of the house and pipe them under or around the new decking dimensions as required. After the deck is installed you will not have this same opportunity as the deck will have to be lifted and removed in sections to gain the same access. Tip : Use PVC (at least 4”) piping below decking, less likely to bend or get crushed below decks than Black Corrugated Drainage (4”) piping. There is no way to give one answer here for everyone to this question. There are things however you can look out for to provide some insight to this question. If your property, before the pool, sits with a higher elevation than the sides, back and front of your property, this is a positive slope and a welcome sign. Positive slope is where the slope goes down and away from your home, the house sitting higher. A negative slope is where the yard is higher in sections than the foundation of your home. This is bad and if you are experiencing this, the water will roll towards the house during rains rather than away as it should. 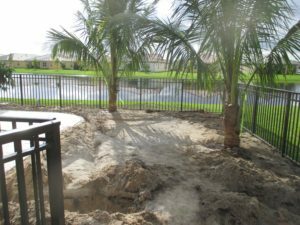 If you have a strong positive slope and if the foundation level is extended for the dimension of the new pool area and the water will still roll downward from your new projected pool patio, this is a good, healthy indication you won’t have a drainage issue. Sometimes, the problem can be, not so much with the new deck that is installed, as it has to coordinate with the leveling of the home, unless a unique design; but we would suggest attention for those with a property that doesn’t drain well to start off with. The 2 photos here show both a problem and a solution for many properties. New problems with drainage can occur more with properties that don’t drain well to begin with, especially smaller properties or those with poor grading throughout the development where water doesn’t leave a property to the easements and away from the area good to begin with. One reason, when looking at the total square footage of the property, the house can take up the majority of that land space itself, especially with smaller lots. There isn’t much room for the water to be absorbed naturally into the land and with poor draining soils, the expansion of a hardscaped, non-draining surface, reduces the available land space further. To put it another way, after the pool is built, there is even less land available for natural drainage into the soil. There is more water going into less available draining space. Solution, especially for smaller lot properties with drainage issues is to tie into the gutter systems that collect the roof water of the home and dispense of them through the gutters. If you don’t have gutters already and this problem arises, your first thought may well be to get new gutters which can help concentrate the water into an area, and can help with drainage tremendously. As the photo with the yellow home shows, by taking the concentrated flow of water from the gutter downspout and piping it into underground drainage piping, this leads away all the roof water collected in that area from the house. 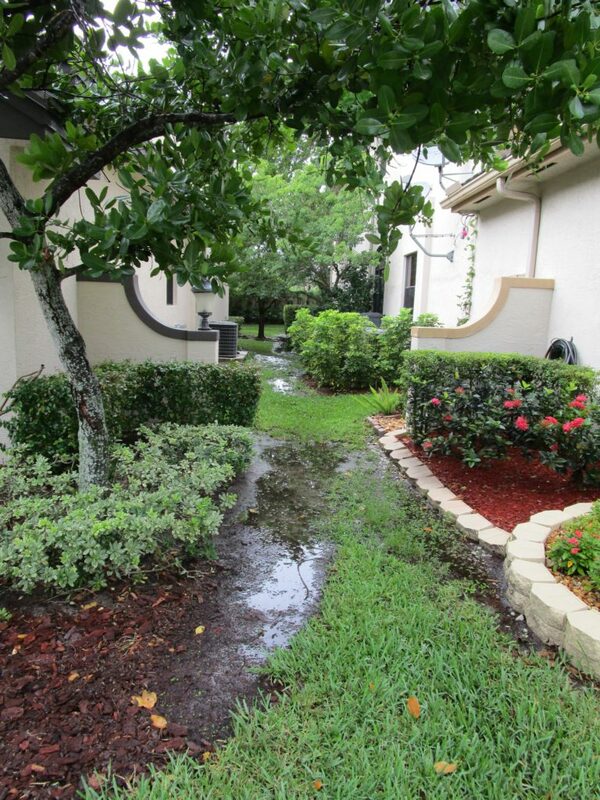 The piping then leads the water to the the property’s natural water easements. By doing this you are effectively working to take that significant amount of square footage of roof water from the home, out of the equation. 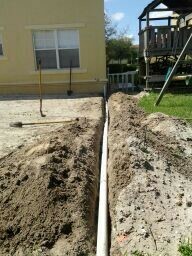 THIS IS ONE STEP IN DRAINAGE WORK WHICH CAN BE VERY EFFECTIVE AND HELP TO RESOLVE MANY HOMEOWNERS ISSUES. 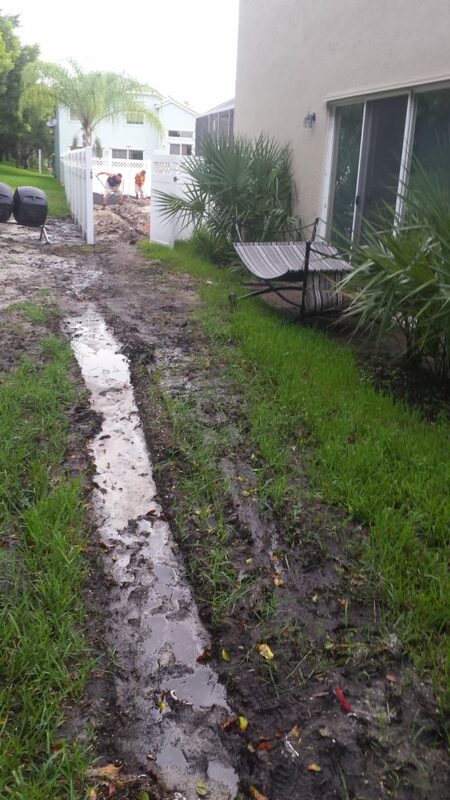 For those still needing more drainage work, as the one photo shows a lot of water in the side of the yard by the pool by the side property line, having neighbor’s with higher properties can also make a problem worse. Our sentiment is not to give your problems to your neighbors by raising your property higher than theirs. Some will work together, often we suggest containing the problem on one’s own land and creating a small burm to help eliminate the neighbor’s water flowing onto your own yard at the same time. Then this water is directed towards the front or rear of the property, often tying in with underground drainage piping and collection point drains to help remove the water from the property. 1) It is typically less expensive to deal with drainage issues while the property is still torn up from the pool construction than at any other time. 2) Make sure the grading is correct BEFORE the irrigation lines are installed. We began with this point about having the grading correct before the irrigation is installed and we will close this section with it here. Once the irrigation is installed, the level of grade is pretty much accepted as finished. If the land is higher than the new pool deck surrounding the border of the pool area, you can pretty much count that the water will not drain away from the pool area. With a higher surrounding area the water will become trapped. If you add roof water into this equation that also doesn’t have a way to get away from the foundation of the home, the situation with holding water is worse. Some properties are blessed with great draining soils and these points hardly present an issue, even during the worst rain periods or heavy storms. Many others, even an afternoon shower will last and be retained where during normal weather, mold and mildew can build up in the yard and even on the side walls of the home. We’ve seen people have mold and mildew cases inside of homes, even ripping up and replacing flooring through large sections of a house with these issues. It is not that often, but enough for us to make those who know they have drainage issues, make an extra note here. So, if you’re property isn’t draining well before the pool is built, take that time an care to take a good look at the pitch of the property before the irrigation is in, the sod installed and the project complete. Something we naturally do, but a word that hopefully will benefit even those we don’t work for. HOW MUCH DOES DRAINAGE WORK COST ? There’s no way we can provide a price to everyone who might be dealing with this here, but if some drainage is added in from the back of a xero lot line property, from the back wall to the property line water easement for some typical xero lot line properties – the prices can range from $350 to $600 typically. It just depends on the size of the area and the situation. To again provide a general idea as to the cost to have drainage collected from the gutters on the sides of the house and running underground drainage piping (PVC) to the front or back property lines for neighborhood water easements, with in-line drains for collection points; the pricing could vary anywhere from $1,800 to $2,500 per side of the house. Again depending on the situation and these are by no means fixed prices, but a general budgeting aid effort. Each property is usually unique in some way, but there are similar problems and solutions often. 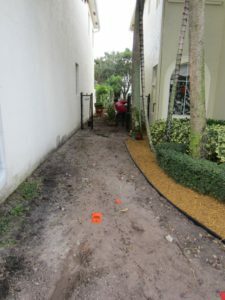 When putting together a drainage plan, we are firm believers in the sense that if you are taking a minimal, less expensive approach to solving the problem, step by step, that is great and even recommended in many cases. But the thing to note is that each suggested step should be working to improve a system, not that one part of work would become obsolete if an increased step was required. Every bit of work should go towards improving a system, with each new stage or step of work (if this is the approach), leads to help improve the situation and to solving the problem. When in doubt, speak with several different experienced contractors who do this work, civil engineers who work with residential clients as well as commercial, or even a trip to visit the on-call engineers who work in your city or county building department. Research and more opinions won’t hurt. At the end of the day, there’s generally 2 ways that water leaves an area where the soil doesn’t drain well. 1 is by gravity, the slope of the grade that leads water to and from or traps it. The 2nd is pressure. This pressure can be supplied to push water by a sub-pump as with many northern properties, or even the head pressure that builds as rainwater falls with force downwards from gravity through a gutter downspout. Taking this head pressure from the gutter downspout and tying it into an underground drainage system, adds force to the water and moves it through the pipe, which is an advantage to any underground drainage piping system. We hope this information may be found helpful for any that are dealing with this issue and providing some food for thought beforehand if considering and getting ready to build that new pool ! This section is not so much about the expense to prep an area, but a note to think about if you wish to add speakers or lighting to your new pool area. If you are planning to build areas with fans, TV’s, outlets or refrigerators, you should consider the cost of adding piping. The cost to add new piping before a pool deck is installed is minimal, after the deck is installed, a much different story. So this is just a note, think up your wish list, put it in the plans for the project. Even if you don’t use these electrical conduit lines, gas prepped lines, speakers, etc. If you choose to in the future, it will be easier to do. Also, if you’re going to sell a home in the planned future, the next homeowner might appreciate that the prep work is there to enhance the area. Putting together a forecast budget for the new landscape after the pool is constructed! The Basics of any landscape after a pool are going to require : 1) Irrigation work 2) New Sod 3) Potential Draiange 4) The landscape design & Install. For those looking to do the bare minimum to repair the property and to save the landscape for another later date, it does cost more later on as there is usually a tear out involved, but budget wise it may make more sense to postpone. In this case, we’ll provide some rough general figures to help plan a budget (again, people like different looks and some want more instant gratification or desire higher cost materials.) Property size alone makes a difference in costs. 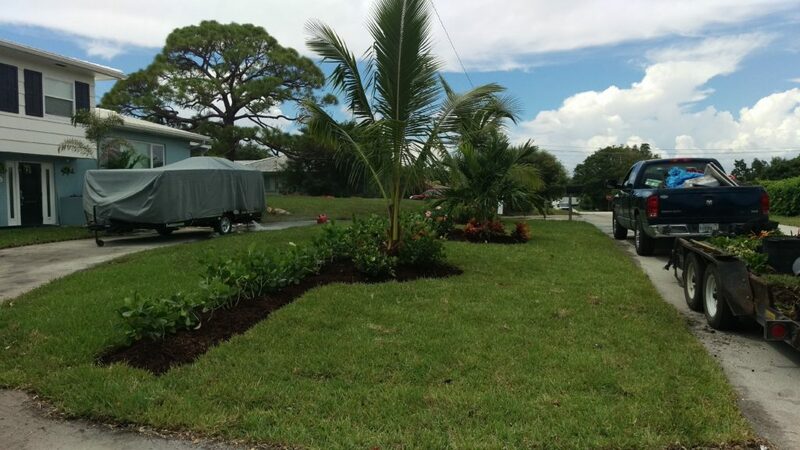 For a xero lot line property with a new pool, the basics of just the irrigation work & sod repair can run in the $2,700 to $3,500 with an average of 3 pallets of Floritam sod roughly. Grade conditions can affect the labor required. 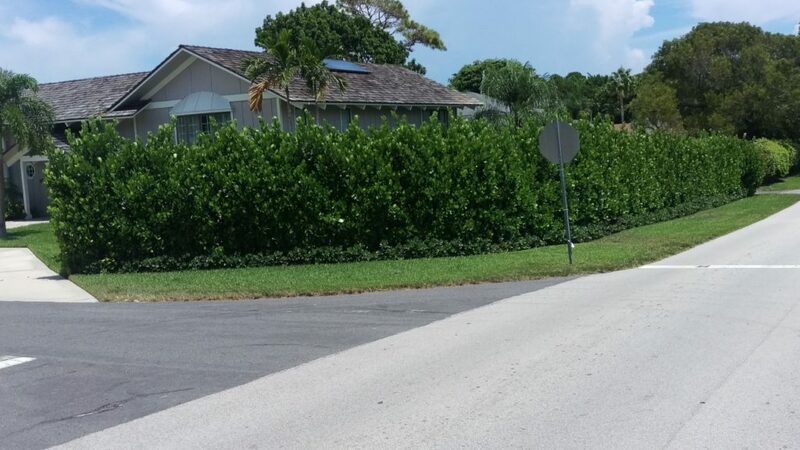 For a xero lot line property with a modest landscape, small hedging allowing time to grow for privacy, some small palms (5’ – 8’, maybe 10’ in some cases), with full landscape bed areas; it may be adequate to budget between $4,600 to $8,000. For a xero lot line property with larger material, # 7 Gal plantings for privacy (3’ – 5’ ) , trees @ 14’ – 20’, full plantings for a complete look with budgets ranging from $8,000 to $12,000. 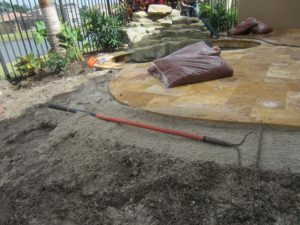 To note if flagstone steps or ground stone instead of mulch is desired these additions can affect the budget from several hundred to thousands on their own, as the coverage area of stone will of course increase the price and stones themselves can vary in cost in a significant way depending on choice. Now, even with xero lot line homes, some have much bigger properties than others and this has an effect. The choices and sizes of materials of course have an affect. But if you plan your budget in this area, you should be adequately covered for most projects. If you go for an unusually expensive tree or for full mature and immediate privacy in your hedging or privacy plantings, or for a lot of stone work, these are factors that will increase costs more significantly than most other materials. You may notice between the 3 budget forecasts for that these examples don’t increase in cost that significantly between these larger quantities of materials on average for what you can receive. Now this is still vague, but hopefully described in a way that you can get a visual. The noticeable difference of value is most recognizable between the first option of just basics and the 2nd of installing a younger landscape. Once the labor cost is covered to prepare the area, cleaning it out, grading the area and having the irrigation installed, the next jump up to the 2nd package is not that significant of an increase to the relative overall cost of the pool project in total. The reason is that the prep work for labor is covered in just getting the basics done, after that, the material cost is the main factor as less labor is required in that additional phase as the bulk of the prep is done. For those that call upon us and reside in our service area in South Florida where we perform the majority of our projects, during our initial Free consultation we will discuss budget as well as the design to make sure we can come up with a project that is comfortable for the budget you are working with if possible. If there are factors of the design that are pushing the project above budget, we can provide different size options on the same material very often, or alternatives. The main thing we feel is that if we can install larger material, we will always choose to do so as this improves the ‘Wow Factor’ of our work and leads to happier customers, which is always good for us both ! Determining the budget is a matter of looking at the overall goals and trying to accomplish everything that is desired against what is practical. Spreading the money out to get more value with an experienced judgement on budgeting for those ‘impact points’ of a design. By saving on some aspects of a project and having some patience on some items, can help to deliver a complete look which will definitely show its value especially as the landscape matures. It’s a different world at night and with each project we design and perform we can suggest a lighting design for that project. Budget to begin at around $2,300 for a 10 light LED system on average. We work with electricians as well who are available for any permit required work. 20 Light systems, with combinations of path lights, ‘wash lights’ & spot lights with budgets around $4,600 to $5,000. 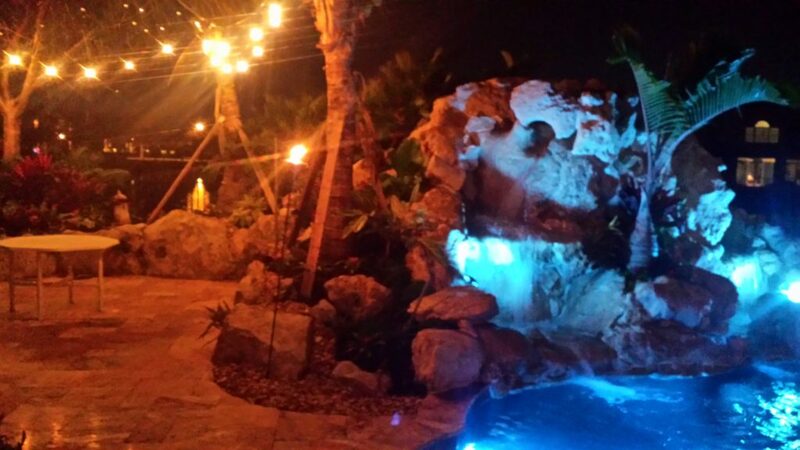 In our opinion, any beautiful setting takes on a new feel at night with landscape lighting and any great scene that’s created should include this option if possible at some point. If not at the time of the pool and landscape completion, some later date. Even starting off with Tiki torches from Home Depot or Lowes if the budget constraints won’t allow for the lighting you might want right away. Even these torches with can be purchased with the mosquito repellant oils can help to make a great accent for your evening enjoyment ! 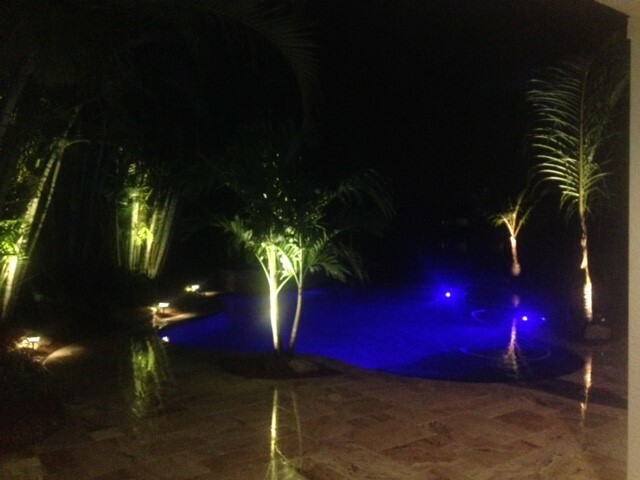 From subtle accenting to more lively, the lighting can definitely affect the mood and beauty made visible at night ! As the sizes of properties and desires can vary drastically, this is a harder grouping to provide an estimated budget for, but we will try to help here. Let’s say you have a mid to larger size property and you’re just wanting the basics done, irrigation repair & sod work. Let’s put in a budget for 4 to 6 pallets of sod and figure a budget between $3,500 to $4,500. For a moderate landscape, palms, smaller hedges, full landscape with some beautiful areas, some patience for things to grow in your budget could range between $6,500 to $16,000. This is a wide variance again, but property sizes vary greatly as well. From fuller looks to those that are more framing. Thicker Resort Style looks to those that are more open and clean like a Mediterranean look or Contemporary. The choices of materials and the size of the property can have a drastic effect on budget. Things we go through as we have 2 main beginning goals, one to create a beautiful design that hits the mark ! 2nd its got to be realistic for the budget and there are ways to provide different options in landscape work, larger verses smaller sizes of the same material allows our trade to be more flexible than most in finding ways to reach the goal. For more dramatic impact for mid to larger size properties, the sky can be the limit depending on the size of the material desired most often, but even an average income neighborhood with a $20,000 to $50,000 budget will produce a look that would be the envy of most neighborhoods right away ! Check out our testimonials, videos and our photos throughout our website here ! The above photo can be installed this size typically at 8’ in #25 Gal container size. 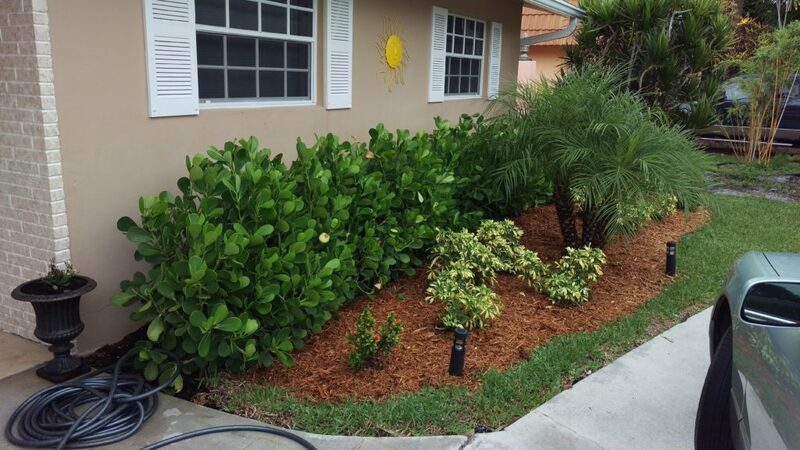 The above photo shows an example of # 3 Gal Clusia just installed. They will range typically from 14” – 20” at the time of installation. The above photo of this same Clusia G. hedge here is shown installed at #15 Gal, 4’ – 6’ size. This is an example of a # 7 Gal Clusia that has been recently planted within the last 6 months after installation. They will range in height from 3’ – 4’ typically at the time of installation. The style and look that is desired. The use of the pool, backyard area for everyday and for those big party events. Shade verses sun desires for the back. 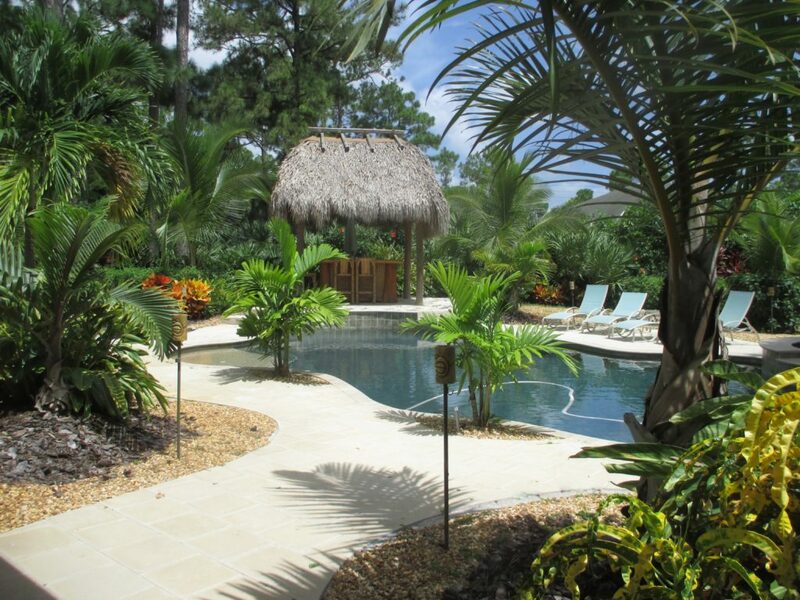 Seating & path areas if desired, firepits, hammocks, swing sets, outdoor kitchens, pergolas, tiki huts, waterfalls, etc. Creating a low maintenance design ! (We consider 3 to 4 trims per year as a low maintenance design standard, anything above this we will note to our customers on different plant or tree items. Thinking of the long term from the conception of the design. Landscaping we view as an art, and actually a living art. In this sense the landscape should look good the day it goes in, but if designed properly, it will look even better 3 to 5 years later than when installed. Longevity of the landscape : A goal for a the majority of a landscape should be between 10 to 15 years. This does not include annual flowers obviously and we work to make our customers aware during the design phase which choices may not reach this mark. When it comes to hedging & trees the goal is higher at 20 years and way above for some choices. The way to achieve these goals on longevity first begins with the choices made during the design stage and then installation and follow through. When it comes to installation it is similar to wanting to build a solid home, the stronger the foundation, the better the start for a solid, well built home. With landscape this comes in to play with the important attention to how the landscape is prepped in terms of grading and drainage first. There is a difference in all trades to the quality of craftsmanship practiced, and with our company and any that take pride in their work, you can tell the quality of the job many times before even the first plant and tree is installed. After the installation it depends on the care. We advise all of our customers to fertilize a few times per year the first few years, helping to provide a good start for the landscape’s life and a better return on the beauty and investment made! Also, and just as important is how to water. Often people will overdo to the detriment of the landscape. Watering more at the time of installation for the first 3 months and long term as a goal to make the property as xeriscaped as possible. This is the difference during a drought and restricted watering how some landscaped yards stay looking good and green while others struggle and can die off. For more information on aftercare please feel free to visit our articles in the ‘Customer’s Corner’ section under “An Introduction to your landscape” & a separate article on “Xeriscaping”. When it comes to Cost – Patience can save a lot of money ! We share this thinking with our customers all of the time. In our experience, we feel we have delivered better when we can complete as much as possible of the goals a customer may have. 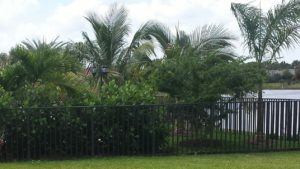 One example, if privacy is not desperately needed immediately and patience is an option on hedging, instead of going with 5 to 6 foot hedges or palms for thickness and immediate gratification, if that material is downsized from #15 gal on average to even a # 7 Gal, 3’ – 4’ height of hedging, that is a large savings. To downsize even further to a # 3 Gal, would save even more significant an amount. This money that can either remain in your pocket or the budget can be used to get more bang for the buck & more material for the design if desired. For example, for the cost of some large trees, an entire backyard at times could have new landscaping. Our opinion in many cases, is to get a smaller size tree and more material for a full and finished look to grow in, rather than that one tree, depending on your budget. (please note : some styles and designs desired may just want that one tree with nothing else to accomplish the goal and look). Another reason why its hard to forecast a budget here for everyone, as styles and the desired look can be so drastically different from one customer to the next, but our goal is to tap into that look desired and deliver every time. Every project we perform is custom designed and is offered to begin with a personal on site consultation to help first determine the style and look. If we don’t hit the target first with the look of the design, who cares what it costs ? If the design isn’t right for you , who wants it. So getting the design right is our first priority. Our next priority is getting the proposal right with the budget if possible. If this is not possible for everything desired, we can usually tell you right up front in that initial meeting. Sometimes even in the first phone conversation when setting up the meeting. 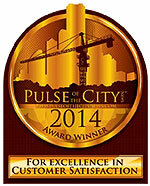 We have been doing this for over 25 years and have an experienced working knowledge on the facets of these projects. Top quality work at competitive pricing ! We will work hard to make sure you chose to call or contact us through our site here. If this article itself or the many others which answer common questions on different topics is any indication, we strive to be detail oriented and amongst the best contractors you would ever hire. 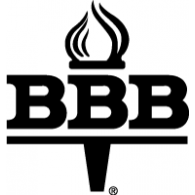 We are proud of the Customer service and product awards we have won year after year, and that is only maintained by a company from top down that recognizes that truth, that every project is custom, and every project deserves the best service we can provide. If you have more questions and you would like to discuss the possibilities of your project we welcome you’re call if you’re in our service area in Palm Beach County. 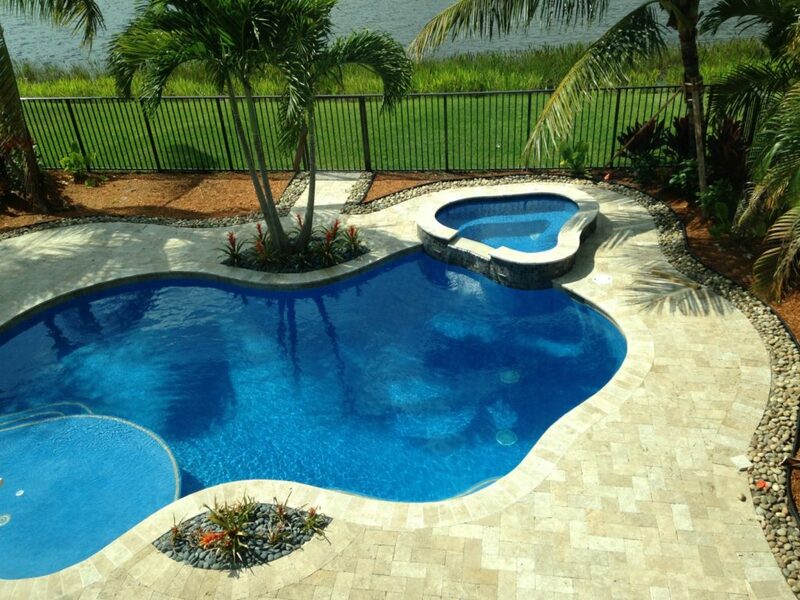 We also serve to Fort Lauderdale and north to Vero Beach, but only for larger projects. We hope you find the information here helpful in your thoughts and planning and if you are looking to have any of this work done, we hope you’ll give us, Universal Landscape, Inc. a call. For those desiring a complete backyard makeover package, through our partnership with Telese Builders, LLC we are on site and can take your project from concept through every facet of the work involving pools, patios, outdoor bars and kitchens, screen rooms, waterfalls, etc, etc. – to completion ! FOOD FOR THOUGHT ON FURNITURE : One last note as you may be planning and reading this article, think about your furniture when you consider the deck size. Tip : take some chairs and stage them in the area your considering to get a feel for the spacing before you commit to your decking size. Many have adjusted after the pool was begun and this can take a revision with the building department once the project is submitted for permitting and construction is underway.